Turmeric is rich in curcumin, which has been proven to act as a very strong antioxidant and anti-inflammatory that also supports digestive, cardiovascular, joint and immune system health. A well known spice in many cultures, turmeric is famous for its flavor and the presence of curcuminoids. Our certified organic turmeric root powder is non-synthetic and of the purest quality. 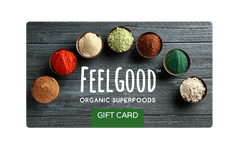 FEEL GOOD Fortified Turmeric is fortified with organic 95% curcuminoids extract and organic black pepper extract for the maximum benefits of curcumin and optimal absorption.